Your Legacy Club scam found at yourlegacy.club talks about partnering you up with a millionaire called Bill O’Doherty, who promises to insure your profits. Don’t invest any money with him, because Your Legacy Club is a scam. Read our in-depth Your Legacy Club review to save yourself from a financial headache! 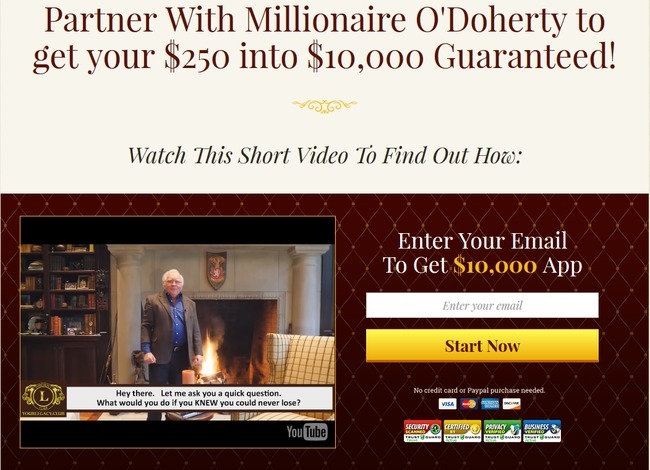 Your Legacy Club tells the story of how a famous millionaire, Bill O’Doherty wants to leave a legacy for himself by helping people becoming millionaires. It may sound like a legitimate partnership with Bill, but it’s just a clever trick the scammers use to cover up the real nature of this scam – an automated binary trading software scam. 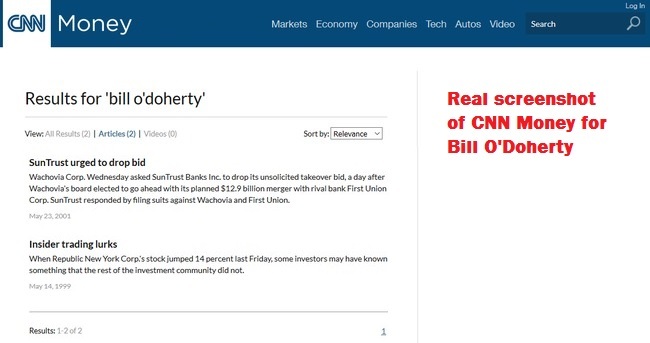 On the surface, Bill seems like a real reputable millionaire with all the photos of him, along with the mention of his name and his app as shown in the screenshots from major financial websites. According to the story in the sales materials, he’s been involved in the financial industry for a long time, and even consulted some leading investment institutions such as Goldman Sachs, J.P. Morgan, Citibank, etc. He’s even said to have published a NY best selling book (although the name of the book was conveniently left out). With all the buzz behind this person, we decided to find out more about him. We conducted a detailed research on this name and the pictures posted within the sales materials. And of course, we went through the NY best-selling list to make sure we don’t miss out any book authored by Bill, O’Doherty, or Bill O’Doherty. Disappointingly, any information about Bill O’Doherty is directed back to Your Legacy Club scam. He is supposedly a millionaire within the financial industry, a respected consultant for world’s leading financial institutions, not to mention a NY best seller who organizes his own book tour. How can someone like this be under the radar? It’s obvious that this identity was created just to promote Your Legacy Club scam. On the website promoting Your Legacy Club app, you’ll see quite a few screenshots alleged taken from reputable finance websites such as Bloomberg, CNN Money, and the Financial Times. Every single one of them seem to praise the software and give high regards to Bill O’Doherty. However, if you take some time to conduct your own research, you’ll find out that these articles weren’t featured on the finance websites at all. Most of these major finance websites provide a search toolbar for users to look for articles within their directories. We’ve performed searches for every single one of the screenshots and their alleged titles, but none of them returned a single relevant result. We encourage you to perform your own search to testify the truth. The scammers are just using fake screenshots to boost the credibility of the scam. 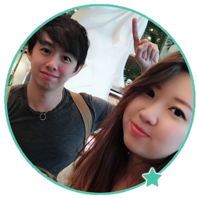 If you scroll further down the sales page, you can find a few member testimonials that claim to have made a fortune thanks to Your Legacy Club app. Convinced that it’s a scam, we performed a reverse search on these alleged members as well to obtain more evidence. The man you see in this image, Hans P. Shultz is actually Tony T Burly, the site owner of a diabetes micro-site called thebigdiabeteslie.info. You’ll be able to find the exact same photo and his real personal information within his diabetes website. The same goes to the other member testimonials featured in Your Legacy Club scam. They are all stolen pictures from all over the internet. Since this is a binary trading software scam, I want to explain how binary trading works to make sure everyone is on the same page. If you have traded binary options before, you may skip ahead to the next segment. Binary options is a grossly simplified form of trading – instead of reading news and analyzing charts, you only need to guess if the price of an asset will rise or fall after a short period of time, usually between 30 seconds to minutes. In practice, trading binary options is not that different from gambling. There’s just no way to predict the market direction in such a short period of time. The odds of winning each trade is just like guessing the outcome of a coin toss – it’s 50-50. Even if you manage a 50% win rate, you’ll still lose money due to the uneven winning vs losing payout. The game is designed to work against you – who would risk $50 to potentially win just $30 to $40 in a game of coin toss? And Your Legacy Club software is just a piece of auto trading robot that choose the trades on your behalf. There’s no partnership to begin with, and the promise of matching your deposit has been a common practice for most brokers for a long time. So instead of losing money by trading it yourself, you are now losing money using a piece of automated trading software. If you decide to sign up for Your Legacy Club, you’ll have to register for a broker account through their sales page (which is an affiliate link). The scammers will earn a sum of referral fees as soon as you deposit into the account. I was assigned to Opteck, an affiliated broker with Your Legacy Club. The minimum deposit with this broker is $250. Even if you already have an account with their recommended broker, you have to register for a new one using a different email address. This is because the scammers behind Your Legacy Club cannot earn their referral fees unless you sign up for a trading account through their affiliate link. Not only that, Your Legacy Club will continue to make money off you over the long term. The team behind Your Legacy Club scam will earn commission for every trade that their system makes for you. To make things worse, since Your Legacy Club software runs completely on autopilot, they can dictate your trading frequency and the trade amounts. In short, they can decide how much commissions to earn off you, as long as you still have money in your trading account. Is Your Legacy Club a Scam? YES, YOUR LEGACY CLUB IS A SCAM. As we’ve said in the review earlier, we don’t recommend binary options trading as a way to make money online, at all. It’s not that different from gambling, and using an automated trading software is no different. You are essentially putting your hopes and entire investment in a piece of software that gambles on your behalf.